I set up fairgating in the last post. The day is now behind me, and it was just as glorious as I may have imagined. The journey began at 9ish Saturday morning. Winston-Salem sits less than an hour to my west, so it's a pretty innocuous trip for me. If I may give a shout-out to my little piece of the Tar Heel State here, I was reminded on the drive that, while they're not there quite yet, fall foliage here along the Piedmont gets quite beautiful. While I love making fall trips to the mountains, there's plenty of beauty right here at home. My roll-dogs for this one were my friends James and Rachel. Both are FSU alums; James from undergrad and Rachel for her master's. James and I did the FSU @ Wake game two years ago, and upon arriving to the lot, we realized we've essentially got a "regular" spot now in the parking lot of the Joel Coliseum, which is adjacent to both the fairgrounds and BB&T Field. We started our day out with some standard beers-and-a-bumper tailgating. Going both seasonal and local, my cooler contained Blowing Rock Oktoberfest from Boone Brewing Co.--which I recommend highly--as well as Dogfish Head's Punkin Ale (because I'm a Delawarean and can't help myself) which never disappoints. It's also worth noting my change in gameday attire. When supporting someone else's team--most often FSU in recent years--my MO has been to wear a shirt in an appropriate team color and something representing my actual team; my "but don't get it twisted..." piece de resistance. Yesterday for me it was a garnet polo with a USF hat that's the shade of "gold" (khaki) that could support either team. James was poloing is as well, in an actual FSU polo. As we sit on either side of the 30 threshold, are we becoming polo fans? I'll take it. I'm still about a half-century from being a sweater vest fan, though. 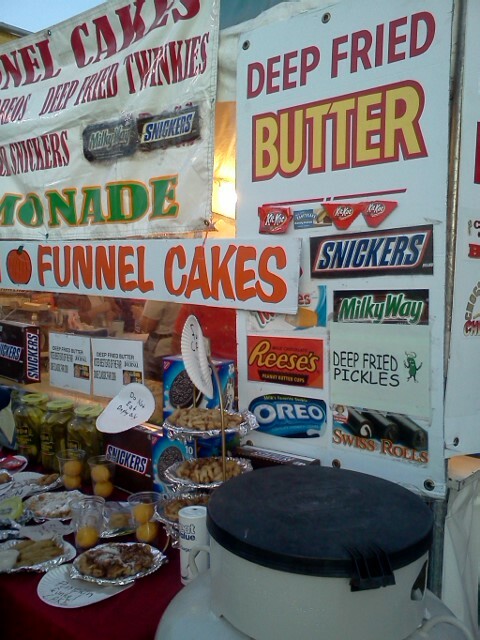 After a few beers in the lot, we headed on into the Dixie Classic Fair to commence the first leg of fairgating. We were actually right next to one of the food areas, so finding fair grub was a quick trip. For me, it was a corn dog and some onion rings. Following that, we headed on over to the stadium, getting tagged for re-entry upon exiting the fair. Naturally, we were on the complete opposite side of the stadium from our suggested entrance. In our trek around, we saw--and I'm stereotyping here, I realize--what appeared to be Wake Forest fraternity and sorority members tailgating adjacent to the stadium, flying such "historical" pieces as a 13 star American flag, the stars and bars (the national flag, not the battle flag), a "Don't Tread On Me," and a Bonnie Blue (I wonder if they recognized the irony of flying the flag of West Florida when playing FSU?). We made our way into the stadium and took our seats in a very heavily FSU area. FSU started redshirt freshman QB Clint Trickett, who has been at the helm for a few weeks while starter EJ Manuel has been on the mend. I conceptualize Wake Forest as the sort of team that many look at the way I looked at Syracuse (before they ruined our Homecoming last year)--a pretty sure W on the schedule. As such, the FSU faithful were beside themselves as the game began to slip away, due in no small part to the Noles being heavily penalized. 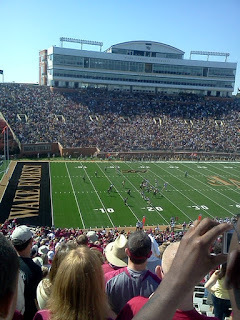 EJ Manuel did eventually take over at QB, but despite matching all of Trickett's passing yards on his first drive, penalties, turnovers, and Wake Forest's offense imposing their will overwhelmed the Noles, who fell 35-30 to the Demon Deacons. The day was pretty perfect weather. The high topped out at around 80, which did get a bit warm with the sun beaming on us for 3 1/2 hours. Still, it was a beautiful day to be at the ballpark and a great day for football. For those looking for this week's High Notes band recognition, sadly, you'll have to do without. A full day of football and fairgating didn't give me the opportunity to see any games on TV, and the one band I saw live, Wake Forest's Spirit of the Old Gold and Black, did not earn their keep. As a band, simply put, they don't impress me much. Owning my big band bias, and knowing that Wake only has about 4,000 undergrads, they are quite small for my taste. A corollary of this fact is that they mic them in BB&T Field, which, at 31,500, isn't a behemoth stadium by any stretch. And you'll recall I took issue with their halftime show two years ago; this year their show was "Finales and Finishes". Sound familiar, Crown fans? Following the game, it was back out to the lot. While waiting for my wife, daughter, and a few friends to join us, we enjoyed a bit more beer and chatted with a few Wake fans out in the lot. We eventually made our way back into the fair and caught up with everyone else for Fairgating II (Electric Boogaloo). My wife had been at the fair last week, and despite not typically going in this direction, tried and highly recommended the fried Oreos, so I partook. 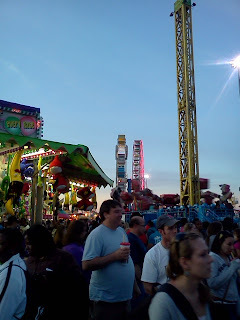 We had a good afternoon-evening of wandering around the fair before calling it a night. My last gastronomic treat was cajun chicken on a stick before we headed out. I don't know how they do it in Texas, but my fair/game combo made for a great day.